The scripture in Deuteronomy 18:20-22 is familiar to most of us which lets us know how to identify a false prophet and a true prophet. It is quite simple, if someones claims to speak in God’s name or claims to be God’s mouthpiece and his prophecy proves to be incorrect he is a false prophet. See the linked post mentioned above to see that the Watchtower has claimed to be a prophet and God’s mouthpiece. Why was Samuel viewed to be a prophet of Jehovah? Because all that he said came true. Therefore Samuel was a true prophet. By making a false time prophecy Hananiah misled the people into believing a lie. This was considered as outright revolt against Jehovah. It was true that YHWH would eventually break the yoke of Babylon and set His people free, but this was not going to happen for many years. Hananiah claimed that God would do it within 2 years. Do we see the similarities? Do we also see a modern-day organization that claims to be a prophet and claims to be God’s mouthpiece? Has this “modern-day prophet” also made time prophecies like Hananiah that have also proven to be incorrect? Can this organization claim they haven’t made false time prophecies in the Creator’s name? 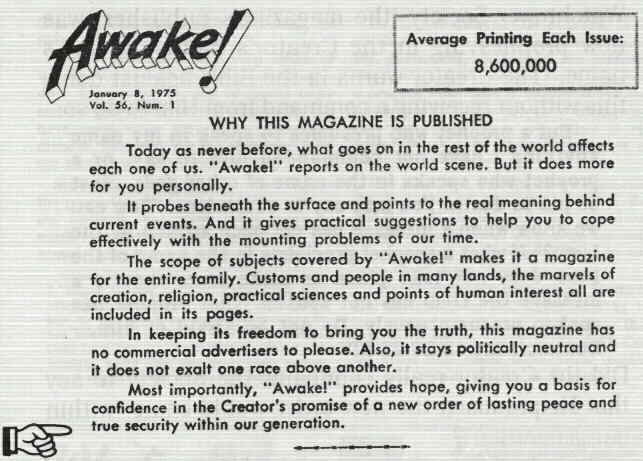 In the Awake! 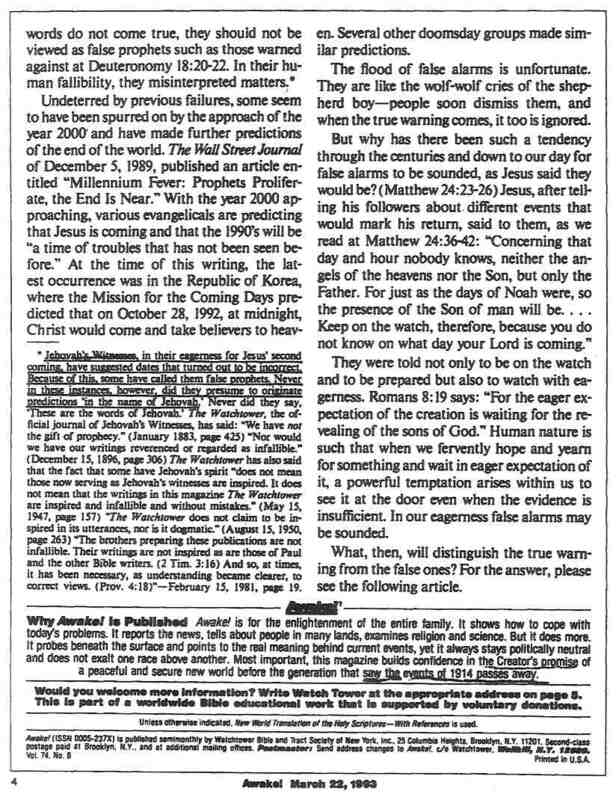 March 22, 1993 they claim that they have never made predictions “in the name of Jehovah”, yet on this very same page they make a false prophecy in Jehovah’s name “… the Creator’s promise of a peaceful and secure new world before the generation that saw the events of 1914 passes away” Don’t you just love the irony! Even the Watchtower doesn’t dispute that this did not come true. Was this “the Creator’s promise”? Or was it a time prophecy based on wishful thinking just like Hananiah’s prophecy? Since the Watchtower organization has “caused the people to trust in a falsehood”, can we not say then that this is “outright revolt against Jehovah”? Shemaiah was another prophet that proved to be false. Read Jeremiah 29:24-32. He also attempted to speak in YHWH’s name saying that he was to replace another man as priest and chief officer. Notice what God says to Jeremiah regarding Shemaiah in Jeremiah 29:31,32 (NWT) – “For the reason that She·mai´ah has prophesied to YOU people, but I myself did not send him, and he tried to make YOU trust in falsehood, 32 therefore this is what Jehovah has said, ‘Here I am turning my attention upon She·mai´ah of Ne·hel´am and upon his offspring.’ “‘“‘He will not come to have a man dwelling in the midst of this people; and he will not look upon the good that I am doing for my people,’ is the utterance of Jehovah, ‘for he has spoken outright revolt against Jehovah. Shemaiah made the claim that Jehovah had said that he should occupy a prominent position. In reality YHWH had not appointed him to this position nor told him to prophesy anything. Does this same claim sound familiar in our day? Is there a group of individuals that claim to be appointed to a very prominent position by God but show that it is not true by the multitude of their false prophecies? In what position have these modern-day false prophets put themselves? Just like Shemaiah they have “spoken outright revolt against Jehovah”. This evidence cannot be brushed lightly aside. Uttering false prophecies is a very, very serious matter in God’s eyes. Now that we have been liberated, at least mentally, from one false prophet let us never again fall prey to another one. How well you have established that the leaders of the watchtower organization has proven themselves to be false prophets and men with tricky tongues so just like the 3 prophets that is mentioned in Jeremiah these men are guilty of outright revolt against our God Jehovah and his Son Jesus. I believe it is very important for all who realize this to warn as many as possible and separate themselves from these men and the organization that they run and return to Jesus and Jehovah and quit have association with this unclead table of unclean false teachings so that Jehovah can take us in and make us sons and daughters to him. If we know it is unclean we need to quit touching it and get away from it or else we run the risk of not being his true sons and daughters. Andrew, this article is a grand slam! One of the BEST articles on this web site! Thank you so much! Andrew, you’ve written a very informative and powerful article. It’s been a very long while since I last read the accounts of these two prophets. I found of great interest the fact that Jeremiah did not at first take issue with what Hananiah had prophesied, but wished that his ‘prophecy’ would come true, since it would be of benefit to God’s people. However, when it was brought to his attention that Hananiah had not really spoken ‘in the name of Jehovah’ what was true, Jeremiah boldly told Hananiah that he had caused the people to ‘trust in a falsehood’. So then, doing something ‘in the name of’ can mean doing something by ‘the authority of’. The question arises: Does the Governing Body claim to speak through the publications by the authority of Jehovah? Those of us who have read the various publications over many decades know the answer to that question. Just to chime in with what others are saying about this article, EXCELLENT! This article cuts straight through all the smoke and mirrors, the double speak and exposes the truth about the Organization. They are a false prophet when compared to the biblical measuring stick. I imagine even false prophets got something right on occasion. I can’t think of one thing that the Society has got right though, that originated with them! Am I missing something maybe? Andrew , you have a wonderful analytical mind , and we benefit here from your contributions . You referred to Jeremiah’s words : ” She·mai´ah has prophesied to YOU people, but I myself did not send him, and he tried to make YOU trust in falsehood. ” The point is well made as it relates to the WTS . I always appreciate your in-depth studies . Revelation 18: 19-21 if anyone adds an addition to these things God will add the plagues which have been written in this book. If anyone takes away from the word of this scroll of this prophecy God himself will take away his portion from the tree of life. I’ll just help you out a little, the passage that you have quoted is from Rev. 22: 18, 19. Awesome article Brother. I read it before but I am reading through Jeremiah now and remembered this article. Those verses you quote mention ” speaking outright revolt” against YHWH. Well as you are probably aware G646 of Strong’s Greek Lexicon says the Greek is ” deflection ” or Apostasy!! So speaking in YHWH’s name and saying something He did not authorize is apostasy!!! Thank you so much for this article! I have spent about 30 minutes going over Jeremiah 29:30-32 and came back to your article for good measure. With YHWH’s spirit and some effort, personal study can be very uplifting! I know you efforts are appreciated by our Father.